In a study of sitting and walking ability that surveyed people ages 50 to 71 across 8 to 10 years, those who tended to sit the most and move the least had more than three times the risk of difficulty walking by the end of the study, when compared to their more active counterparts. "We now use the Internet to go shopping, order groceries, send messages, and even gossip," DiPietro says. "We used to walk down the hall and gossip; now we send it via email or text." The researchers recorded how much those in the study watched TV, exercised or did gardening, housework or other physical activity at the beginning of the investigation. They included "light" physical activity like "puttering around, walking to get the mail, or walking to the car" says DiPietro. The result of that would be "phenomenal," to mobility, she says, and be at least a start toward heart health, too. Dr. Andrew Freeman, who directs cardiovascular prevention and wellness at National Jewish Health in Denver, and represents the American College of Cardiology, says people should do even more higher intensity exercise regularly — at least to the point of being "breathless." OK. Being a couch potato is not good for your health. No surprise there. But let's explore exactly what goes wrong if you sit around too much. It can increase your risk of heart disease and stroke. 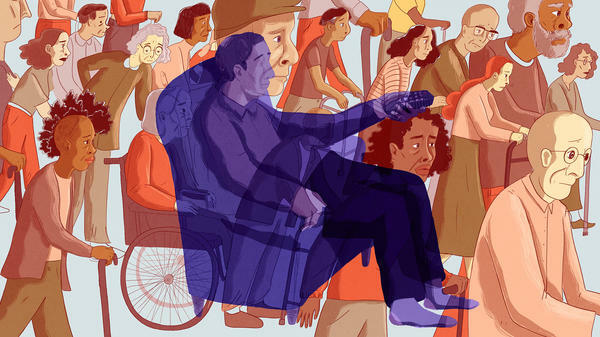 And new research finds that for people 50 and over, it can also make it more difficult to walk and even increase the odds of not being able to walk at all. Here's NPR's Patti Neighmond. PATTI NEIGHMOND, BYLINE: If you don't routinely walk on the job, you can probably relate to Liz King (ph). She's 61 years old and busy starting a vegan food company in Denver, but does it pretty much sitting down. LIZ KING: When you have your own business, you have a little more flexibility. But I'll tell you one thing that's constant is at least that eight hours of looking at the screen and sitting in the chair. NEIGHMOND: After that, being glued to the computer doesn't necessarily stop. KING: The inbox, it's overflowing, an online class that I may be taking, let me take care of a chat session or a group that I belong to. NEIGHMOND: Then there's about an hour of TV-watching. It all adds up. In fact, epidemiologist Loretta DiPietro with George Washington University says lots of people do a lot more sitting - a two-hour commute back and forth to a desk job plus evening TV time can easily top 13 hours of sitting, which is why DiPietro headed a study looking at how prolonged sitting affected older people's ability to get up and walk. She looked at federal data from questionnaires that asked more than 134,000 older people how much physical activity they did. LORETTA DIPIETRO: Walking, gardening, housework, exercises, recreational activities. NEIGHMOND: And even things that might seem pretty lightweight. DIPIETRO: Puttering, walking to get the mail or walking from a car. NEIGHMOND: She added up all the activity and compared it to how long people sat. Over 10 years, those who sat the most and moved the least had the greatest difficulty walking, saying they walked really slow or were unable to walk at all. DIPIETRO: Those people had three-times the risk compared with people in the highest physical-activity category and reporting the lowest amount of sitting. NEIGHMOND: The biggest culprit in prolonged sitting? TV, mostly because unlike in an office where you get up now and then and walk down the hall, when watching TV, many people just don't budge. DiPietro offers an antidote - get up every 30 minutes. DIPIETRO: At least, like, stand up, march in place, jump around, kick your legs. NEIGHMOND: For only about one or two minutes. A commitment to get moving is always good news for older people, says cardiologist Andrew Freeman with the American College of Cardiology. ANDREW FREEMAN: The way we want people to exercise is to walk or exercise in whatever form to a level of breathlessness. And for some people, that's just walking at a slow pace. NEIGHMOND: Liz King breaks up her day with a 20-minute walk - longer on the weekends - and her pace, well, it varies. KING: If I'm walking solo, I'm probably walking at a more leisurely pace because I tend to take a picture of the occasional wildflower (laughter) or the clouds that are in a wonderful formation. NEIGHMOND: In a group with people who are speedier, she keeps up. All a big win, says cardiologist Freeman, who says exercise is nature's best medicine. Patti Neighmond, NPR News. Transcript provided by NPR, Copyright NPR.